So the positions on Brexit by the various social-democratic reformist left groups were … thoroughly social-democratic and reformist – what a surprise! 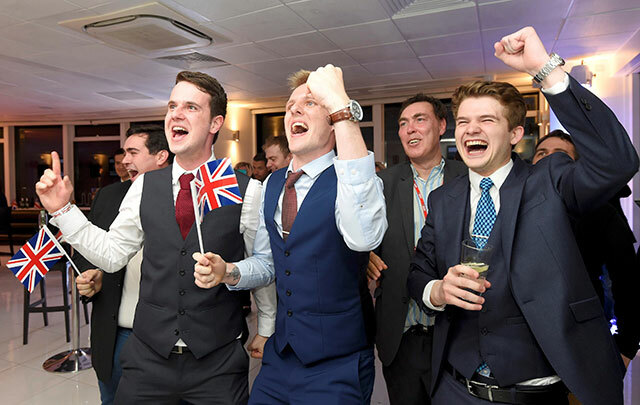 Whether they supported Leave or Remain, they did so strictly within the capitalist framework, and whatever their ostensible rationales, they ended up tailing after one or the other side in the reactionary, immigrant-bashing circus. The International Communist League (ICL) and its British section, the Spartacist League (SL/B), on the other hand, swore that they were “standing on the revolutionary, proletarian and internationalist principles of Marxism” when they called for a “Leave” vote (“EU: enemy of workers and immigrants,” Workers Hammer, Spring 2016). Yet as we have shown (see “British EU Referendum: Who Voted for What, and Why”), the post-referendum assessment by these ex-Trotskyist centrists was strikingly similar to that of the reformist Socialist Workers Party (SWP) and Socialist Party of England and Wales (SPEW). While the SWP declared the vote for Brexit a “stunning blow against the people at the top of society” (Socialist Worker, 28 June), the SL/B and ICL called it a “stunning defeat for the City of London, for the bosses and bankers of Europe as a whole as well as for Wall Street and the US imperialist government” (Workers Hammer, Summer 2016). For the bosses and bankers as a whole? In its previous issue WH explained in some detail that “opinion in the City of London is also divided”: hedge funds were for Brexit (to escape EU regulations), the investment banks (mostly U.S., German and Swiss) were against. So if it gets too costly, the big banks will just shift EU operations across the Channel, or the Irish Sea. An inconvenience, to be sure, but hardly a stunning defeat. Ditto for industrial bosses: car manufacturers like BMW will just ratchet down production of the Mini at Oxford and Swindon and up it at their Born, Netherlands plant. Both before and after the vote, Workers Hammer argued that a British exit from the EU would “creat[e] more favourable conditions for working-class struggle across Europe.” So how does imposing further restrictions on Polish workers entering Britain (the main selling point for Brexit) aid workers struggle in Europe, or in Britain? How does voting for “Britain Out” in a campaign dominated by English chauvinism bring German and French workers closer together in common class struggle? How does it embolden Italian workers to revolt against the diktat of the Eurobankers that would wipe out their retirement savings if tottering Italian banks go under? How does it encourage Scottish workers to direct their ire at their Scottish nationalist rulers? How does it mobilize British workers to act in support of French workers who at that very moment were striking against anti-labor laws? Answer: it doesn’t. And if in fact the Brexit vote is “an expression of hostility from the downtrodden and dispossessed” (Workers Hammer) or a “revolt against the rich” by “people who are generally forgotten, ignored or sneered at” (Socialist Worker), in calling for a vote to Leave the EU, these opportunists have helped divert this unfocused sentiment away from their main enemy, British capitalism (recall that Britain is not part of the Schengen free-transit agreement, nor is it subject to the austerity decrees of the masters of the euro). The SL/B argues that Brexit would “further destabilize” the EU. Quite likely, although by how much remains to be seen. But such destabilization could go in sharply different directions: it could certainly embolden right-wing racist and outright fascist forces such as the National Front in France, as it already has. The SL/B and SWP both downplayed the impact of the anti-immigrant campaign, The SL hasn’t even bothered to mention the post-referendum upsurge in anti-immigrant attacks. They both justified their call for Leave by saying that if racist forces were prominent it was Labour and the trade-union tops who were responsible by not fighting against the EU. That does not alter the fact that xenophobic and nationalist appeals drove the Leave vote. Workers Hammer raises the additional argument that “both pro- and anti-EU camps in the Tory party whip up anti-immigrant chauvinism.” Precisely, which is a key reason why genuine Trotskyists opposed both sides in this referendum that was fought out over how best to limit immigration. In this case, the Brexit campaign and vote, dominated by anti-immigrant and English-chauvinist bourgeois forces, have heightened inter-imperialist rivalries without strengthening the class consciousness, militancy and international solidarity of the working class. The ICL argues, correctly, that the EU is not a supranational state but an imperialist-dominated alliance or trading bloc, established by the 1992 Maastricht Treaty. Trotskyists are opposed to the EU and seek to bring it down. But how? The only answer given by the ICL (along with most of the reformist pseudo-radical left) is to withdraw. But that leaves the imperialists in power on both sides of the Channel. Last year in the battle over the brutal austerity imposed by the European central bankers on Greece, the ICL’s answer was to call for Greece to leave the EU (“Grexit”). What about calling instead, as the League for the Fourth International did, to bring down the whole structure of capitalist/imperialist Europe through sharp class struggle leading to continent-wide socialist revolution? This is never mentioned, not by the reformists nor by the centrist ICL. Why not? Because they believe it is impossible, a pipe dream. Consequently, from Grexit in 2015 to Brexit in 2016, the response of the pseudo- and ex-Trotskyists of different denominations to every crisis in the imperialist EU is a bourgeois program. “The political crisis in Germany brings into question the Versailles regime in Europe. The Central Committee of the German Communist Party declares that, having taken power, the German proletariat will liquidate the Versailles documents. Is that all? The abolition of the Versailles Treaty as the highest achievement of the proletarian revolution! What is to be put in its place? There is not a word about this. Such a negative way of putting the question brings the party close to the National Socialists. The Soviet United States of Europe – that is the only correct slogan which points the way out of the splintering of Europe, which threatens not only Germany but all of Europe with complete economic and cultural decline. In the guise of competing with the xenophobic rightists for “oppositional ground,” the ICL has taken the same tack as groups like Lutte Ouvrière in France and the Socialist Party of England and Wales. These pseudo-Trotskyists justify embracing anti-immigrant campaigns (banning the Islamic hijab, “British jobs for British workers”) by the need to win over backward sections of the working class, competing on the same political terrain as the National Front and UKIP. This is what the ICL has done with its opposition to calling for asylum for Syrian refugees, and to calls for freedom of travel for immigrants within the EU (see “Strange Encounters with the ICL,” The Internationalist, August 2015). And now we have a repeat over Brexit. It all fits together. Back when the Spartacist tendency stood on the program of revolutionary Trotskyism, calling for opposition to all imperialism and proletarian revolution to bring down NATO and the Common Market (Workers Vanguard No. 307, 11 June 1982. 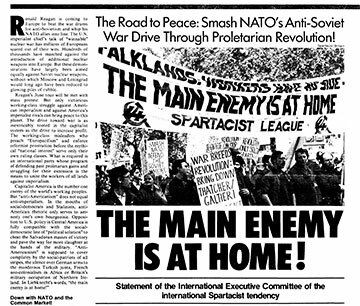 Today for the “post-Trotskyist” Spartacist League/Britain, the main enemy is no longer at home. The ICL joins much of the British reformist left in calling for imperialist Britain to leave the imperialist European Union. Oh yes, the ICL continues to raise the slogan of a Socialist United States of Europe – as do most of the reformists for that matter, giving it their own social-democratic twist. It also calls for full citizenship rights for all immigrants, although that is now qualified with the phrase “for all those who have made it here.” (Refugees need not apply, as ICL no longer calls for asylum.) But these slogans are reduced to ritual incantations – “pie in the sky in the sweet bye and bye,” as the revolutionary syndicalists of the IWW used to say – a “maximum program” suitable for Sunday speechifying. Above all, they are not linked to the current class struggles, and in fact are contradicted by the ICL’s support for Brexit and Grexit. Notably, with all its calls for “Britain Out!” of the EU, Workers Hammer is silent about the roiling strikes in France. 1. We previously quoted Trotsky’s analysis of (and opposition to) the Stalinists’ support for the German nationalists and fascists in the Prussian referendum in our polemic on the issue of Brazil impeachment. See “Stumbling in the Dark With ‘Blown-Out Lanterns’,” The Internationalist, June 2016.